Do you have big plans this summer? Do you want some? 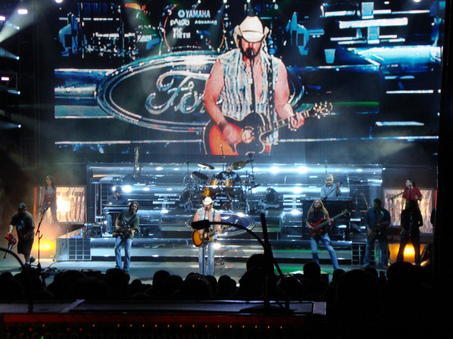 ‘Cause Toby Keith and Ford Trucks are taking their longtime partnership on the road again, this time in the “Live in Overdrive” Tour, and could be inviting YOU to join them! The tour’s accompanying sweepstakes offers some snazzy swag, like the weekly prize of a signed Toby Keith photo and Clancy’s Tavern CD, and a “Live in Overdrive” Tour t-shirt. There’s also the monthly prize an acoustic guitar both signed by Toby and played by him on tour. But the humdinger is the grand prize of a new Ford F-150 with EcoBoost, an all-expenses paid weekend of Toby concerts, AND a private meet-n-greet with the big man himself! Visit http://fordvehicles.emipowered.net/overdrivetour/home/?srccode=313126-006 to learn more, enter the sweepstakes, and experience a little of life on the road. And scroll down to see just how well Ford and Toby complement each other.